I must admit I've gone off mugs a bit, temporarily. I only made a few this week; here's one I was pleased with. I've been doing what I do in the studio when I don't feel especially creative: waxing bottoms, loading a bisque, mixing up glaze tests. The little smiley stickers have a shiny, plasticized surface, which makes them work better as resist than, say, yard-sale price stickers. I'm also working on using stickers as reverse-resist: brushing cold wax over the, on bisqueware, and then peeling off the stickers before glazing. 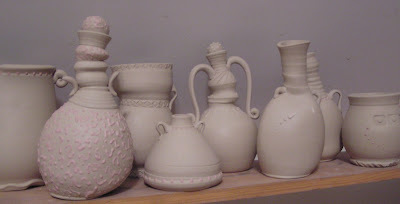 I'll post those when I get back into the glazing/firing part of the making cycle. 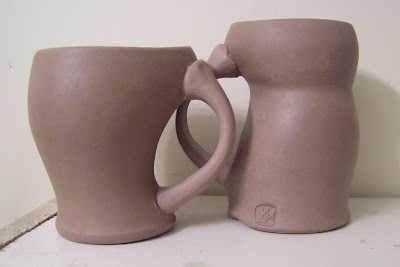 As you can see, I've veered off into the sculptural a bit, but still perfectly functional mugs. I'm delighted to say that the 100 Mugs show has a time, date, and location: The June Fitzpatrick Gallery, at 522 Congress St., Portland, Maine, will host the show on April 28th, from 9 AM to noon. Anybody out there in the Portland area, I would so love to see you there! June has been very gracious and enthusiastic about this project, which in turn makes me feel encouraged. I have done the wetwork on about 40 mugs now, and having a definte date set has, surprisingly, changed my mindset slightly. I am still thinking of it as a developmental exercise intended to push me into exploring new forms and surfaces; but now I also think of The Hundred as a body of work, and the show as a kind of meta-artwork. One thought that has occurred to me looking at the pieces so far, is that they are so various that they could almost have been made by different hands. 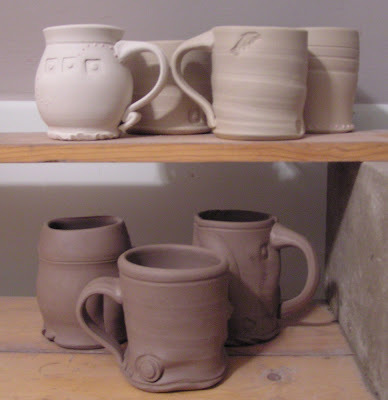 I would really not like the exhibit to resemble a rummage sale, so I need to find a means of visually unifying the mugs. The trick is to make them sufficiently different as to fulfill the mission of the project, yet similar enough to seem all to belong together. Since I use a lot of pattern anyway, I am thinking of dots as a unifying motif. 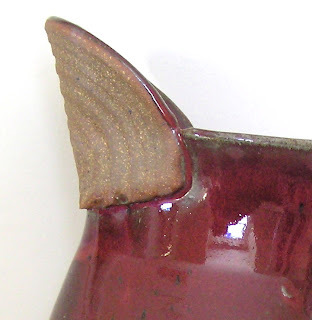 I could change the scale, prominence, and method; some would be slip or added clay, some glaze, some a wax resist-subtractive technique. 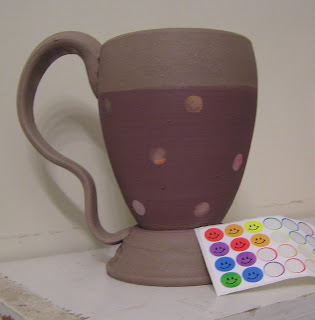 There could be very few dots on some pieces (or one dot; that might be amusing), while others would be peppered. I think I can make this work, but I am still brewing ideas. I find that when I am in my cubicle, working away at my inconvenient part-time office gig (IPTOG, for short) I'll get ideas for mugs. I'll then sketch the thought on a post-it not, and hang it on the wall. One cabinet is papered with them. 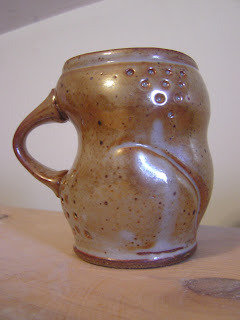 I am away from my camera at the moment but will post photos of the latest pots when I am able. Just had my first Etsy sale. Woo-hoo! I feel like I did after my first kiss: now I can stop worrying; I'm not a loser. By coincidence, it was the pitcher in the photo in the last post. I started posting items in my Esty shop at the beginning of the year, as part of my effort to find new venues to show and sell my work, itself part of a larger effort to spend more time making pots. So far I am distinctly underwhelmed by the response! I didn't expect a mad rush but I thought I might have a sale, say, every week or two. So far, nothing. Nada. So, is it just January or (my default assumption) am I doing something wrong? 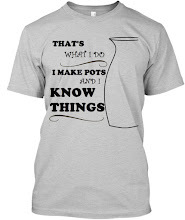 I did click around to many potters' Etsy shops, for fun, of course, but also to see if anybody actually is selling anything, as that information is available for each seller, and the answer is, almost everyone has had some sales, even people who only recently opened. So, what's the secret? Any ideas? 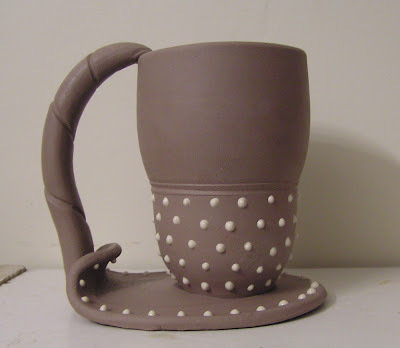 Here are some of my efforts to change up the mug handles a bit. These, I think are working pretty well - lots of the others seemed a little contrived. Maybe it's natural that things seem forced at first, since I am pushing past my comfort zone. I am reminded, however, that my standard handle became my standard for a reason: because it works well. Not that no other form could work well, but there are many more handle shapes that work poorly than well, and I seem to be trying all of them. ...This is hard! Also, it takes much longer than just throwing mugs for sale or for an order. After attaching fifteen handles tonight I noticed that although the shapes and throwing marks are all differnet, the handles all have a sameness to them -- all pulled, same width, etc. 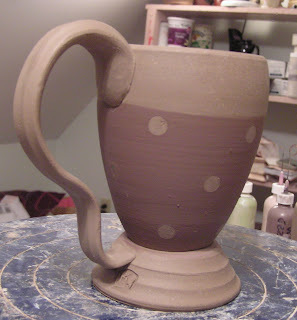 So tomorrow I will think more about that, when I attach the handles to the mugs I threw today. Also I may use a different cut-off wire, maybe a stretched spring, to add another variable. The good thing is, this exercise is already doing what it is intended to do, which is to make me more concious of the decisions I make about form. 85 to go. Plus some extras, for luck. ...And Here are Some of the Mugs! I sent off the proposal for "100 Mugs in 100 days" to three galleries via email this morning, fully expecting to recieve no response at all...and by noon I had two yesses! Which of course inspired me to get cracking. 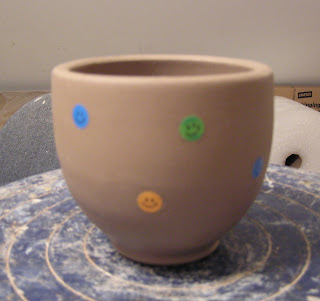 Something I've read lately -- maybe in Ceramics Monthly -- has given me an idea. This has been rattling around in my head since I read it wherever. 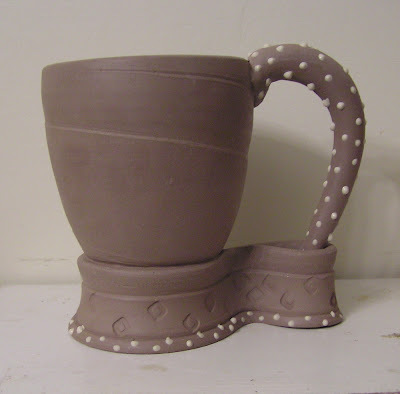 It's not that it's so difficult to throw 100 mugs in 3 months; the idea is that, by concentrating on one functional form and trying to make each different from the last in a meaningful way, a potter might come up with new forms and ideas. The guy in the article did 100 mugs in 100 days as a personal challenge, but doesn't it sound like a great event title? At the end of the one hundred days (April 11th by my count), a coffee-with-the-artist type opening, at which the guests employ the mugs, get a chance to talk with the artist (aka me) and hopefully buy a mug. I'm gonna do it. I've got the perfect location in mind, with a couple of back-ups, if that one doesn't work out. I also know where I can borrow some of those giant thermos things, the kind where you press a button on the top. Better get to making! 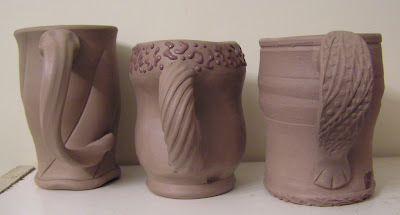 Made a lot of silly, functionally challenged pots today...just to have something to slip-trail. No Wonder I Can Never Find My Sponges! 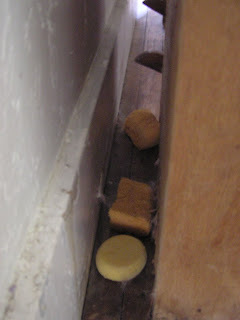 Happy Jack runs off with them, but now I've found his secret stash! The Great Discard: go through closets and drawers, looking for things to throw and give away - a New Year's tradition. I have one resolution in addition to these I posted earlier: no more custom work, no matter who asks! It stresses me out, and, no matter what, I can never match the image that is in someone's head, so no one is ever quite satisfied. 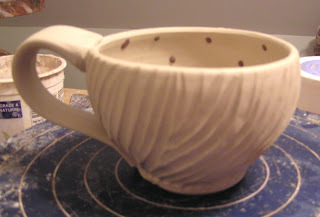 If a person wants something like a mug or a butter dish, something that I am going to make anyway, fine.